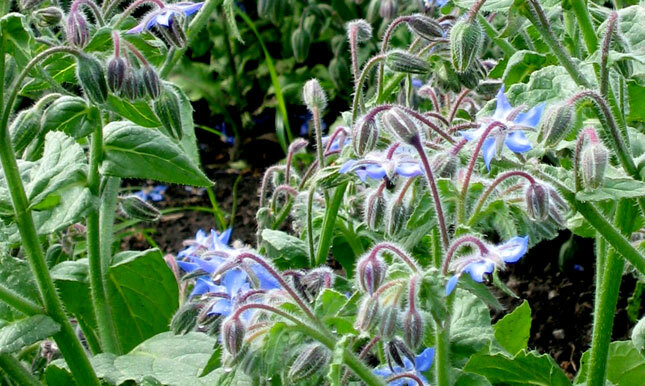 Borage is easy to grow. Sow seeds in spring, just barely covered, as the seeds need light to germinate. Plants will tolerate poor soil and shade. Situate borage well as it dislikes being moved and self-sows prolifically. Plants get big as the summer progresses, so thin to 0.6 - 0.9 m (2 - 3 ft) apart. Bees love the starry blue blossoms, which are edible - and a nice addition to summer drinks and salads. Tender, young leaves have a mild cucumber-like flavor. The seeds of the plant have the highest concentration of GLA (20 - 30%).